Naperville based Sebring Design Build (rebranded from Sebring Services in 2017) has specialized in kitchen remodeling, bathroom remodeling, basement remodeling, basement finishing, and home additions since 1999. We are focused on building long lasting relationships and providing a seamless turn-key experience for our clients in the western Chicago suburbs. Design is at the center of our process with a showroom and designer to help guide our clients through the selection process. Our dedicated project managers, combined with our online scheduling and messaging interface ensure every project runs smoothly from the start to completion. We are a design build company who appreciates all the components of construction and would love to hear from you about the project you are considering! Redstart Construction, Inc. is an award winning, full service home remodeling contractor specializing in room additions, kitchens, bathrooms, basements and custom homes. Our goal is to create lasting relationships with our clients by providing the highest quality service in the industry while also giving you the greatest value within your budget. We will assist you through each step of the process, including design, product, material and color selections. It is our job to make the construction process as seamless as possible so that you can begin enjoying the living space of your dreams. We take pride in every project and relationship we build. We believe those relationships are earned through honesty, hard work and exceptional quality. Reliable Home Improvement is a full-service home remodeling firm serving the greater Chicagoland area. We specialize in everything from bathroom and kitchen remodeling to designing and building custom home additions. Supported by talented designers, builders and architects, Reliable Home Improvement saves you time by serving as a single source for all your home improvement projects. We eliminate the need to contract several vendors for one job by providing you with full-service remodeling from concept to completion. Visit Our 15,000 sq. ft. Home Improvement Showroom! *Authorized Dealer of Andersen Windows & Doors* Revitalize your home's exterior with Opal as your contractor. Our dedicated team specializes in siding, roofing, windows and doors. We serve Chicago area suburbs with everything from roof repair to complete exterior home renovation. Have a wonderful remodeling experience! Our process is centered around communication, education, top-rated solutions, and 5-star service. Choose from top quality brands like Andersen windows, Beechworth Windows, GAF roofing, ProVia doors, Mastic Vinyl Siding, and James Hardie Fiber Cement Siding. Our remodeling showroom is located in Naperville, stop on by to see our product line first hand! Opal Enterprises is an exterior remodeling company that specializes in improving the way you feel about your home's exterior! We help you achieve the right solutions to bring lasting comfort to your valued home! Work with certified and manufacturer endorsed contractors. Opal is a James Hardie Elite Preferred Siding Contractor, Beechworth Windows Elite Contractor, GAF Master Elite Roofer, and an authorized Andersen Windows Dealer! Hold your contractor to a higher standard... The Opal Standard! Our firm was established in 2004 and has been providing outstanding residential design services to the Chicagoland area ever since. Our specialty is providing a truly custom home through a design experience that is tailored to your needs. Our regular clients particularly value our past construction experience as well as our desire to keep our knowledge of green tech and energy efficient construction techniques up to date. Based in Naperville, IL, Adam Hartig is an award winning, certified kitchen and bathroom designer that specializes in space planning, consulting, remodeling, & project management. Since 1990, Hursthouse has created enduring outdoor spaces all over Chicago. We’ve built for more than 2600 families, drawn more than 4500 designs, and shifted more than 7 million shovels worth of soil. Our profession is landscaping. But our passion is life. By taking the time to understand what’s most important to each client, Hursthouse is able to create extraordinary outdoor environments that both reflect and enhance people’s lives. By recognizing each team member’s unique skills—and providing the resources and down time essential to keep perspectives fresh—the company boosts loyalty and innovation in its workforce while ensuring exceptional service and results. At Tranquility Builders, we pride ourselves on honesty, integrity and dedication to our clients’ projects. We view each project as a teamwork effort between our clients and us. From the design phase to planning and construction through completion, we are there to assist you with every detail right down to the material selections. Fill out our “Request for Appointment” online or Call us for your free, in-home design consultation. We will respond to your request within 24 hours. From there, we set up an appointment to discuss your ideas and explore your options. We are here to assist homeowners define their vision and realize their goals. The process starts with our first visit to your home. We will discuss the issues you are trying to address to learn what you are hoping to achieve. We will talk about your wish list and tour the areas in your home you are looking to renovate to identify the project scope. We will show you examples of other home improvement projects we have completed and will walk you through our design/build process to answer all your questions. We may need to meet with you several times during the planning process as we begin to fine tune the scope of your project. We will then schedule another appointment where we will present you with floor plans and elevations (if applicable) and a detailed proposal for your review and approval. We promise that all of our materials and workmanship will adhere to the highest standards of excellence. All work shall be completed in a workmanlike manner and according to governing municipalities building code requirements. Tranquility Builders, Inc. does not make any warranty or representation beyond that of the manufacturer as to materials utilized. We stand behind our work for five years after the completion of your project. Issues that come up will be handled promptly and professionally. Normandy Remodeling is a Design/Build remodeling firm that develops plans and designs and then executes those plans to create a single point of contact for a homeowner’s remodeling project. Normandy Remodeling has been providing award winning additions, kitchens, baths, and renovations to Chicago area clients for over 35 years. Normandy is known for great service, high ethical standards, and exceptional quality of work. Their dedication to their clients has previously earned them the title of Remodeler of the Year by Professional Remodeler Magazine, as well as the distinction of GuildQuality Guildmaster Award annually 2008 through 2015. Centrally located in Hinsdale, Normandy services the entire Chicago Metro area. Normandy’s headquarters also features an 8,000 sq ft showroom that allows prospective clients to learn more about the renovation process and makes the selections process for existing clients quick and convenient. Platinum Poolcare has raised the standards of excellence in residential and commercial pools, spa and waterscape design and construction. We have a half-century of experience in building, servicing, maintaining, and renovating award-winning and nationally-recognized gunite pools throughout the greater Chicago area and other Midwest states. Platinum Poolcare Aquatech, Ltd., founded in 2007, and resulting from a merger of Platinum Aquatech, Ltd. (luxury swimming pool construction) and Poolcare Aquatech, Ltd.(service, repairs, renovations of swimming pools and spas), specializes in all aspects of pool design, construction and renovation with added focus on specialty aquatic features such as waterfalls, lazy rivers, rock water applications, statuary and other luxury waterscape amenities. The company also provides installation and maintenance services for its customers. Based in Wheeling, Ill., the company’s headquarters spans 10,000 square-feet of warehouse and office space with 53 trucks, 100 employees during peak season, and one of the industry’s largest onsite replacement parts inventory for quick fixes. Platinum Poolcare has repeatedly graced the cover of various industry magazines, and has earned hundreds of awards for its designs. The company belongs to the prestigious, invitation-only Aquatech Society for professional pool builders. *Authorized Fieldstone Cabinetry Dealer* Crimson is a full-service design/build residential remodeling firm serving the North Shore and Naperville area. We are known for our attention to detail and high-quality work and professionalism. We bring architecture and construction together for a truly seamless process. Our design/build process for remodeling brings together professional architectural design with a systematic, organized approach to the construction process. Crimson handles both the design and the construction, which means that clients receive a grater continuity of service. The joining of design and construction not only saves time and money, but formulates a partnership with the client throughout the process of home remodeling or expansion. With superior design, quality craftsmanship and outstanding customer service, you will appreciate Crimson's specialized approach to your unique experience. Fieldstone Cabinetry authorized dealer. Ask about our special promotions on Fieldstone Cabinetry. Call today for a free home consultation! Charleston Building and Development is an award winning custom home and semi-custom home building, renovations and development company. We are a full service building and development firm that offers the very highest end of custom home construction as well as semi custom homes and luxury renovations. Unlike any other builder in the area, Charleston establishes an entire project team for your home remodel or design project. No matter the scope of the project, our clients work with a team of experienced professionals who are dedicated to exceeding expectations delivering the best experience, service and value possible. With well over 70 years of combined experience in the development, home design, building and renovation industry, we can tackle any project. In addition to custom home design and construction, we also have a portfolio of kitchen renovations, bathroom remodels and home additions that we have done throughout Naperville and the surrounding Chicago suburban area. The Kitchen Studio is an award-winning family owned design firm specializing in custom cabinetry, design solutions, and installation services for the entire home. We design, remodel and renovate kitchens, bathrooms and other residential spaces in Glen Ellyn, Wheaton, Elmhurst, Oak Brook, Naperville, River Forest, Hinsdale, Arlington Heights, Downers Grove, Oak Park, Winfield, Burr Ridge, Geneva, Inverness, St. Charles, and the Chicago area. Whether our experienced designers are working on a master bath remodeling project or a kitchen renovation designed around your family, we work with you from design to installation, ensuring each element fits your custom lifestyle. Our projects have been featured in national and local publications. We strive for beautiful and functional spaces that are a perfect reflection of our clients' needs and desires. But before you start sending out dozens of emails and making phone calls, sit down and think about your project. What's your budget? What is the scope of your project? Will you need more than one type of professional to complete your home improvement project in Naperville, IL? Can you afford to complete the full project now, or should you tackle it bit by bit? Once you've settled on your project’s priorities, budget and scope, it's time to start researching Naperville, IL home design professionals. Don't sell yourself short and settle on the first professional you set your sights on. Make sure that you're working with someone local, who can get to the jobsite easily and efficiently. Look into the person’s reviews, ask to speak with former clients and to see previous jobs in person. Take a good look at their portfolio photos: How similar are these projects to your own? Be honest — that mansion might look beautiful, but it might not have a lot in common with your little bungalow. Reach out to multiple professionals — especially for larger projects — and don't settle for the first bid you hear. Comparing multiple Naperville, IL professionals' bids and experiences can help you find the one that’s best for you. Ask a lot of questions now, so you won't have unexpected answers later. Find a home design professional on Houzz. Narrow down your search by type of professional and location. 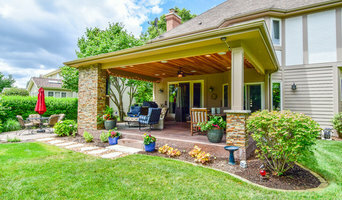 Browse Naperville, IL portfolio photos, read client reviews and contact each Naperville, IL professional for more information. Check out the information in the specialized professional sections too for tips on how to hire the right professional for your project.